I can't think of a better place to get the freshest produce than at a local farmers' market. I had the opportunity to visit one of the most popular markets while I was in Washington, DC earlier this month with Destination DC. The Dupont Circle Market, run by Freshfarm Markets, has been a centerpiece for locals since it began in 1997. I was so excited to see the market in action and I was not the least bit let down on seeing the crowds of customers. I was amazed to see more than 30 stands of produce and artisanal products all lined up under tents in the parking lot of PNC Bank and the adjacent street. Dupont Circle Market was first on the roster of farmers' markets opened by Freshfarm. Since the organization's founding, farmers' markets have been sprouting up throughout DC as well as Maryland. One of the newest markets added is By the White House Market, which was inaugurated last September by first lady Michelle Obama. 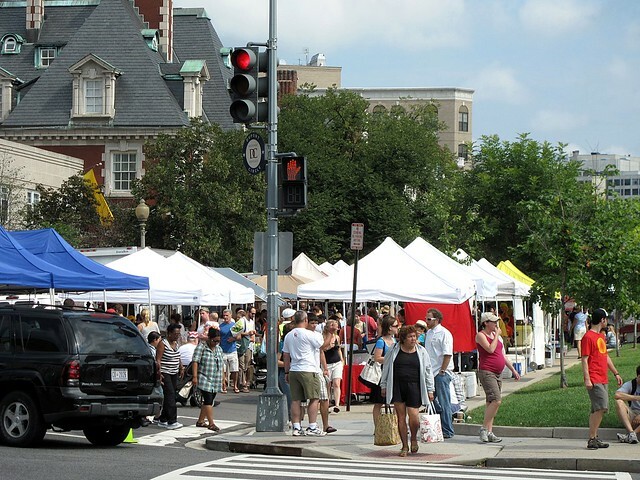 Still Dupont Circle Market is considered by many to be one of the nation's best. It was most recently voted the 7th best farmers' market for travelers by CNN. As soon as we arrived at the market, we were greeted by Freshfarm's codirector, Bernie Prince, who gave us an in-depth tour of the market. She introduced us to many farmers and sellers who bring their products from all different areas. Products sold come from the Chesapeake Bay watershed region, which includes Delaware, Maryland, Pennsylvania, Virginia, and West Virginia. At the market you will find baked goods, dairy products, fruits, vegetables, flowers, and even soaps. As Bernie explained, Freshfarm Markets are producer-only markets, which means that the farmers may only sell what they grow/produce themselves. All prices are set by the farmers and the money we spend goes directly toward supporting their livelihood. One of the first stands we stopped by was that of Toigo Orchards, where farmer Mark Toigo was on hand to talk about his unique Japanese corn variety, Mirai. It's known for being one of the sweetest and most flavorful corns. Olga from Mango Tomato actually had a good taste of the corn, eating the whole cob raw. I'd never even though I could eat corn raw until then. Mark also had amazing stone fruits and melons, many of which were sliced up for sampling. I couldn't help myself and tried one of each, the aromas of the peaches alone was enough to draw me in. Customers were flocking to Toigo that day. Stands we visited included Next Step Produce with some of the best-looking organic vegetables I've ever seen; Everona Dairy, which offers delicious sheep's milk cheese among other products, the Mushroom Stand with beautiful specimens of foraged mushrooms; and Clear Spring Creamery, which sells creamy yogurt in four flavors among other dairy products. I sampled the unflavored yogurt, which was ever-so tangy, smooth, and luscious. I wish could have taken home a gallon of it. I was so surprised to see beautiful blue crabs at Buster's Seafood caught by fisherman Jimmy Hogge. Another unique sight was the wall of corn at the Spring Valley Farm stand. Bernie says that by 2 p.m. all the corn is sold. We were there at 9:30 a.m. and they were already restocking. At Endless Summer Harvest, Kathleen Jorgensen showed off her stunning hydroponically grown lettuces, the definition of perfection. Country Pleasures had lovely jars of jam and preserves as well as some very fine-looking garlic, so much better than the ones shipped from afar. While at the market, don't be surprised if you rub elbows with a few chefs or two. It's well known that many chefs use the market's produce in their restaruant kitchens. The market also features Chef at Market, where noteworthy chefs are invited to offer cooking demonstrations and/or book signings. I had a lovely time perusing the market and wished I was a local myself so I could take bushels of fruits and vegetables home. I love my Union Square Greenmarket, but at Dupont Circle I felt very at home among all the locals. All of us in the group seemed to have a special time. I even spied Cathy of Gastronomy Blog eating a giant juicy white peach from Toigo. She later admitted to even having an empanada from Chris's Marketplace, where I tried the amazing crab cakes. I don't know where she puts it. If only I would have bought an empanada for the trip home. If you're ever in the DC area on a Sunday morning, make an effort to stop by Dupont Circle Market. It's well worth the trip. Open every Sunday, from 9 a.m. to 1 p.m. from April through December; and from 10 a.m. to 1 p.m. from January through March.